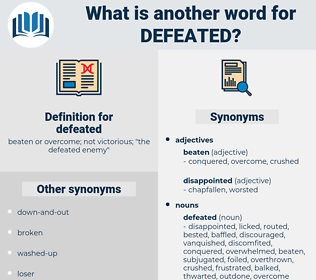 What is another word for defeated? beaten or overcome; not victorious; " the defeated enemy"
conquered, overpowered, vanquished, Trounced, outplayed. Triumphed, Fought, Overcame, Denied, fell, won, repudiated, Deposited, stopped, abandoned, assaulted, lost, Disagreed, qualified, Refuted, earned, led, tabled, edged, team, failed, Prevailed, ended, Suffered, Disallowed, Scored, opposed, diffused, blamed, bested, dismissed, Overruled, Surpassed, Raced, broke, smashed, Annulled, discarded, set, Filed, Entered, Gained, Reached, Refused, ruled, forces, Took, rejected, BT, HIT, quit, Discounted, dumped, foiled, expired, topped, Served, released, Objected, Grew, unpacked, Shunned, downed, Went, al, beat. devastated, Eradicated, Decimated, destroyed, intimidated, frustrated, faded, Battled, assassinated, Eliminated, withdrawn, Slaughtered, Declined, upset, Faltered, Deleted, Combated, combatted, overthrown, annihilated, Deprecated, disapproved, Ceased, Fought, evacuated, depressed, evaporated, deducted, Stigmatized, collapsed, delayed, obliterated, dissipated, shattered, Struggled, Challenged, Demoted, demolished, destined, deposed, deferred, deprived, overcome, Toppled, Ostracized, fallen, dismantled, Denied, Tackled, wasted, saved, won, subdued, repudiated, Averted, overturned, accepted, discontinued, bypassed, stopped, abandoned, countered, Rebuffed, battered, Ousted, withheld, lost, Excluded, Circumvented, thwarted, disqualified, terminated, Confronted, overwhelmed, Abated, Jeopardized, contested, stifled, disappointed, extinguished, cancelled, Overridden, felled, Disappeared, elections, Interposed, Avoided, eroded, removed, postponed, rescheduled, forfeited, Negatived, attained, murdered, Excreted, impeded, failed, Prevailed, Resisted, ended, oppressed, matured, convinced, Contrasted, pulverized, condemned, diminished, turned, Repulsed, suppressed, Disallowed, extended, routed, Curtailed, halted, disposed, campaigned, nullified, opposed, Abolished, Achieved, blamed, finished, bludgeoned, bested, dismissed, engaged, Waived, Overruled, flawed, lapsed, Vetoed, Harvested, confused, abused, stranded, blown, phased, undermined, broken, Disbanded, Surpassed, obstructed, dropped, Quashed, recalled, Shifted, Rebutted, Knocked, exhausted, smashed, Subsided, crushed, Repelled, reversed, misplaced, Annulled, fulfilled, ignored, Aborted, overlooked, elapsed, discarded, realized, Hindered, set, molested, moved, Repealed, Precluded, solved, uncovered, dashed, Compromised, Prevented, Refused, doomed, surmounted, Voided, struck, discharged, Upheld, frayed, missed, Strayed, ruled, rejected, shocked, Grounded, neglected, stripped, untied, HIT, inverted, washed, Emitted, Revoked, ruined, Killed, severed, vanished, IOST, Exported, thrown, Discounted, barred, Passed, resolved, hurt, convicted, Judged, checked, dumped, vented, Screwed, expired, sidelined, undone, Met, Served, Whipped, Complied, sold, released, Omitted, unlocked, cleared, busted, Spanked, driven, Supplied, licked, spurned, Spilled, Spilt, stuck, shot, Shunned, shorted, downed, Pushed, blocked, pinned, imported, Shipped, Occurred, Gotten, gone, Logged, Punched, gunned, Screened, shed. The enemy recognised that some movement was afoot, though in their confidence they never expected that their defeated foes would dare to attack them. Perhaps the Portuguese allowed themselves to be defeated. defeat, doubt, debit, debate, deep-dye, defat, daybed, devote, deviate, depth, deputy, devoid, debut, daft, dead body, deft, devout, diabeta, duvet, DVD, david, debt, dubiety, deep-eyed, deadbeat dad, devoted, dipped, day by day, divide, depot, devotee, deaf-aid, depute, doped, divided, divot, deadbeat, davit, dipodidae, day bed, deathbed.